Create beautiful mobile friendly guestbooks for your properties and area in minutes. Stay in touch with your guests before, during and after their stay with smart messaging. 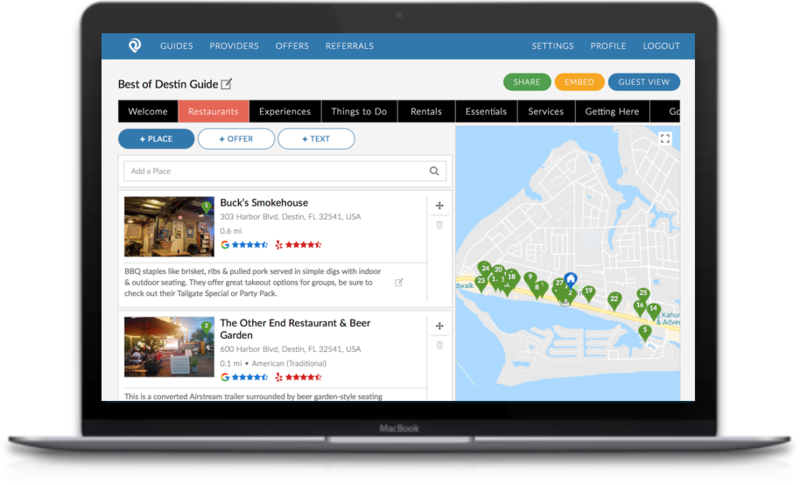 Give your guests everything they need to know about the best restaurants, activities, events and essentials in your area. Start with basic information provided by our search algorithms, then customize it as you please. Our mobile-friendly guides update automatically. Answer questions from your guests before, during and after their stay with smart messaging. 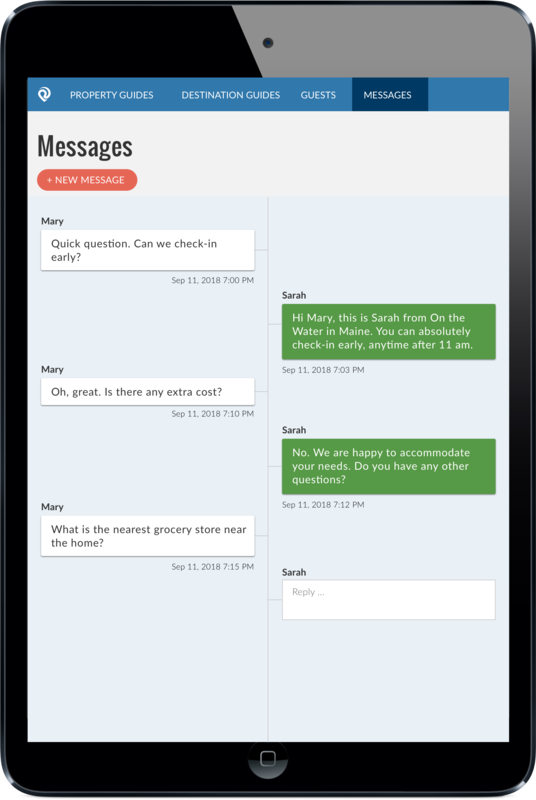 Our two-way chat feature lets guests ask questions like the location of the nearest grocery store, whether late check-out is possible or the WiFi password and receive an instant response from you or your team by text. Smart Messaging works on personal mobile devices. No additional equipment or installation is needed. 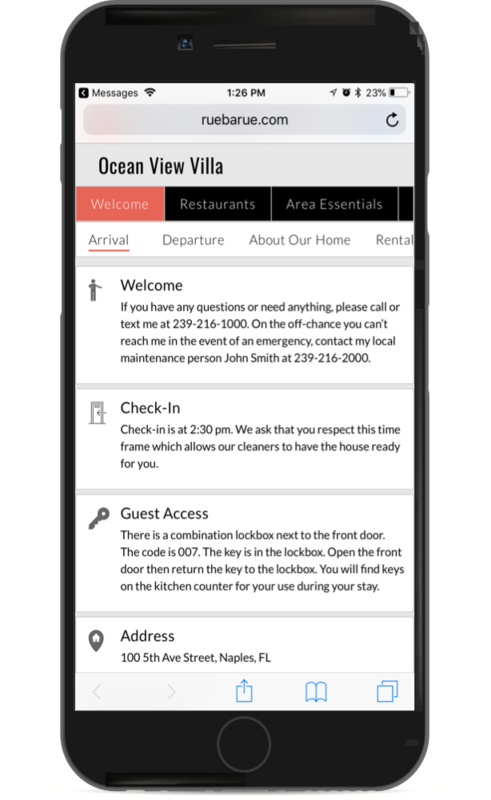 All the information your guests need about their vacation home and the area is on their mobile devices and updates automatically, so there's no need for clunky binders, brochures and photocopied instructions that easily become dog-eared and outdated. Our platform lets you schedule the dates you want your customers to receive their guestbooks. Guestbooks will be sent automatically by email or text with a customized welcome message from you. Include your smart messaging phone number so guests can ask questions before they arrive. An all-purpose guestbook and smart messaging will enhance your guests' experience. They can assist guests planning their stay, help their vacation run smoothly and convince undecided guests to rent. Share them with new and existing customers in promotional newsletters, emails and blogs. Meet our customers and see what they say about RueBaRue.